Over the last two years, CAFOD has supported local partners to rebuild schools, repair damaged water systems, and to run training workshops with people from affected communities, so they can build safer homes that can withstand earthquakes. Dhaibung and Laharepauwa are two remote Nepalese villages in Rasuwa district that were badly hit by the massive earthquakes. The families in this area are traditional farmers, who have used livestock to work the steep hillsides and harvest crops. Many lost their homes and their cattle during the catastrophe. Together with a local Nepalese charity Parivartan Patra, CAFOD is supporting more than 2,800 families in these villages. To help them pick up farming again and earn an income, we have given each of the 18 village wards a handheld motorised mini-tractor. Using oxen or other livestock to plough the land was a slow and expensive process. Families were earning just enough to get by. 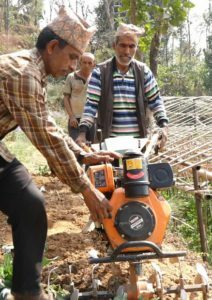 But now – fully trained and using the machinery – the farmers have started to reap the many benefits. The farmers can now produce much more, enabling them to sell their food at market and commercialise their farms. They have also stopped using oxen to plough the hillsides. Previously, oxen would work for four or five months of the year, but the rest of the time they would still need to be fed and cared for. The farmers can now sell the oxen to others working in areas where the land is flatter and easier to plough. 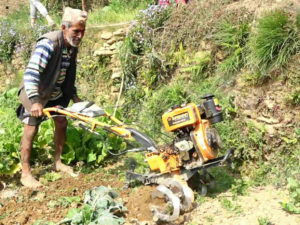 “Whereas before we would have to pay 15,000 Nepalese Rupees (around £113) for an ox to work in our fields, and it would take 12 hours to complete, now we can do the same work with a mini-tractor in about two hours, and it only costs us 5,000 Rupees (around £37),” explained Bhawanatha Paudel. 63-year-old Bhawanatha, who is just one of the farmers benefiting from the mini-tractors, lives with his wife, three children, daughter-in-law and two grandchildren. Their home, located high up the hillside, was completely destroyed by the first earthquake, forcing them into very difficult times as they struggled to get by. One of the benefits of the mini-tractors is that the farmers have time to do other things, and many are using the time to learn new skills and develop their farms. Before distributing the mini-tractors, farmers were trained in how to use, maintain and repair them. One person in each ward has the responsibility of managing the mini-tractors, and money paid by farmers to loan them is used to repair or maintain the machines. Bringing innovative techniques like these mini-tractors to remote communities is just one way we are helping people get back on their feet. With support from CAFOD, we have also been helping villages in Rasuwa district with housing reconstruction and the building or restoring of toilets and water points which were all destroyed by the earthquake. 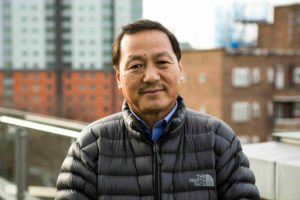 It will take many years for Nepal to fully recover, but thanks to your donations, CAFOD’s Church partners have reached hundreds of thousands of people affected by the earthquakes. Your generosity and prayers have given hope to families who two years ago lost everything.